In my second article of the laser weapon series (see the first part here on CO2 lasers), I'll be expanding on the potential of pulsed lasers. A pulse of directed light energy. This concept has been around for a long time. In fact, the first laser (invented in 1960) was fundamentally a pulsed laser. 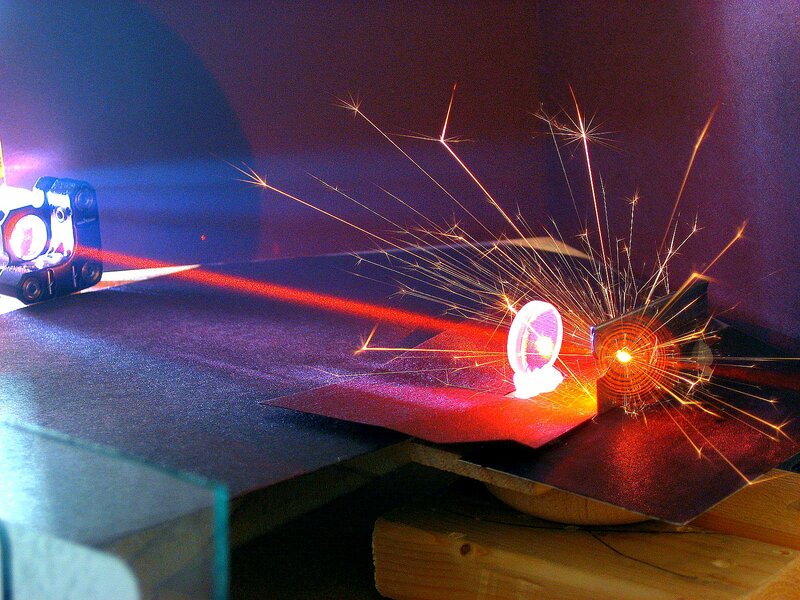 Check out this great article explaining the history of lasers. 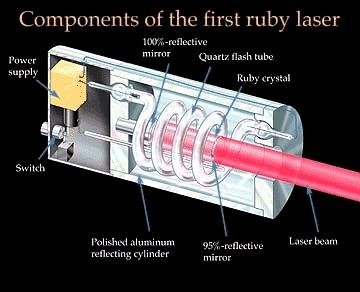 As a weapon, a small ruby laser would barely be able to penetrate a razor blade. However, this same concept could be used in a larger scale, with slightly different components. Imagine if the release of the rod could be electronically triggered, using an electro-optical mirror, or a simple semi-reflective surface triggered by electrical current. Several pulses of light could be generated with no energy release, charging up the rod like a capacitor or battery. Then, once substantial (huge) amounts of light energy had been stored, the semi-reflective mirror would be triggered and cause all the stored light to leave the rod in a high-energy beam. This would take place over a very small amount of time (30-40 milliseconds), and potentially release megawatts of light energy. As of now, this technology doesn't exist applicably for a handheld weapon (or maybe it does, locked away somewhere underground... who knows). However, the National Ignition Facility is progressing in laser development, the time will come eventually. 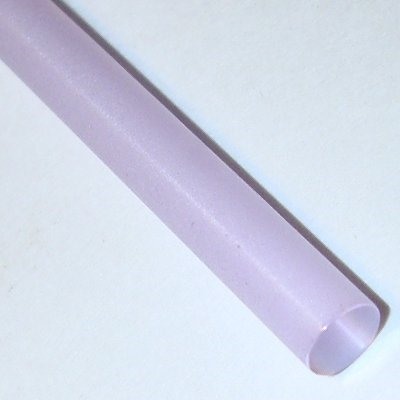 A flashtube or laser diode is used to "pump" YAG lasers; they can produce intense energies with the potential to be weaponized. However, as mentioned for all pulsed lasers, we simply do not have the technology to store enough energy for an affective handheld laser weapon. Even though making a handheld pulsed laser weapon is nearly impossible, it's still fun to build a ruby/YAG laser. The parts are pretty easy to buy online. All you need is a xenon flashtube, ruby/YAG rod, capacitors, charging and pulse transformer, power source, and trigger. The most expensive components is the ruby/YAG rod and the mirrors. The helical or straight (helical generally works better) xenon flashlamps are costly, but affordable. The flashlamp driver must be build yourself with consideration to whatever flashlamp you chose. Flashlamp drivers usually consist of a transformer charging unit, capacitors, and a pulse transformer for triggering the flashlamp. They can also be purchased online, but they're very very expensive (see here). And be sure to check out Making Electromagnetic Weapons: EMPs and Directed Microwaves. These projects use high voltage! Don't electrocute yourself. LASERS CAN INSTANTLY DESTROY SIGHT! DO NOT misuse a laser or use without eye protection. It seems the power requirements for laser weapons are still too high for practical use. The speed & precision is incredible, but is it possible to create a capacitor array / battery pack / whatever that would be able to produce the required voltage & maintain a charge for use in the field? Guess we'll just have to wait and see. Right now, the next closest thing to a combat-ready laser weapon on the ground isn't exactly "handheld"—and probably won't be ready for another ten years or so. But still, something interesting to look forward to, considering Pink Floyd thought of it first, haha. To pack electrons is not the problem, it can be done. How people use it would be the problem. Has anyone tried a camera flash capacitor connected to a laser pointer? How much can they handle without burning out?